JACKSONVILLE - Defensive Back Fred Shaw (6'2,230) signs with the Jacksonville Sharks for his ninth season of arena football. This veteran defensive back last played with the Cleveland Gladiators in 2015, totaling 48 total tackles, eight pass breakups, and one interception. In 2014, Shaw played for both the Philadelphia Soul and Tulsa Talons. Between the two teams Shaw managed to amass 40 tackles, 1 pass breakup, and one forced fumble. 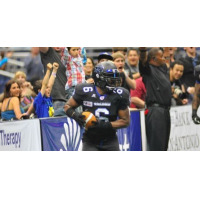 He played for the Talons in the 2013 season, a season of which he made 77 tackles, 16 pass breakups, two forced fumbles, 10 interceptions returned for 129 yards and two touchdowns. In 2012, Shaw set career highs with 135 tackles, seven pass breakups, two forced fumbles, eight interceptions for 138 yards and two touchdowns. In 2011, Shaw played for the Tulsa Talons, which was the same team prior to the team's move to San Antonio. That season, he totaled 78 tackles, an impressive 20 pass breakups, one forced fumble, one fumble recovery, and six interceptions for 78 yards. After taking a couple-year hiatus, Shaw then signed with the Oklahoma City Yard Dawgs and piled up 89 tackles, 20 pass breakups, one forced fumble, one fumble recovery, two interceptions returned for 59 yards and one touchdown. Shaw began his arena career in 2007 when he started for the Oklahoma City Yard Dawgs. During his rookie season he totaled 75 tackles and eight interceptions.